Our buddies over at Arkon sent over one of their new Samsung Galaxy Tab fold-up stands to review and I’ve got to say, this is a great little product. Made from what appears to be high quality plastic, the stand folds up to 7″x1″x1″ and can be easily-stored in your laptop bag, briefcase or other type of man-bag. It has adjustable legs and backing, grippies for that non-slippage we all enjoy, and should be considered if you own any kind of tablet. Video action after the break. Buy one at Arkon’s website. 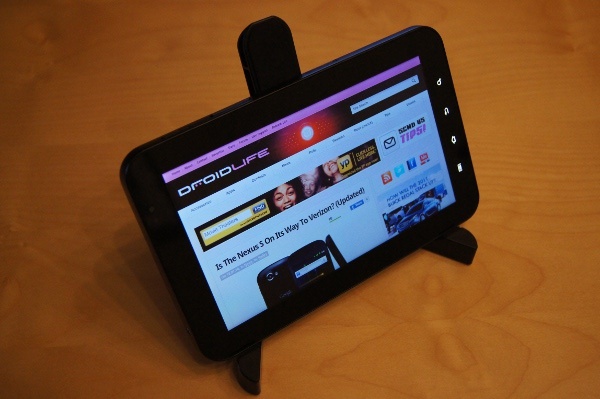 Our Galaxy Tab review here.